This was a quick, entertaining read. In fact, I read it in less time that it took to fly home from Disney World, thanks to a three-hour layover. I don't usually read young adult fiction, but this one seemed worth reading when I was asked if I was interested in reviewing it. I haven't read Melody Carlson before, but I appreciated how she weaved Amish culture and beliefs in with this coming-of-age story. She's an author I'd share with my daughter when she's older. The book begins with a teenage girl named Micah facing the misunderstanding-turned-lie that she wasn't actually a boy like her long-time pen pal, Zack, assumed. While circumstances that set up the story were unrealistic, the plot flowed easily and the characters seemed to face realistic internal conflicts. 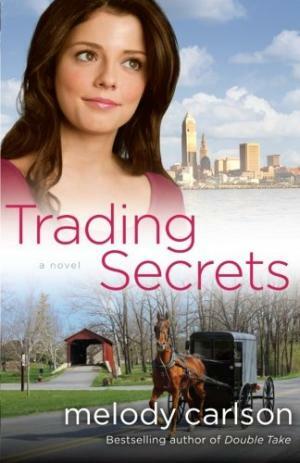 ABOUT THE BOOK :: Released in October, "Trading Secrets" brings young adults a tale of worlds colliding, secrets being revealed, and friendships forming. Teens will enjoy this story of miscommunication and mishaps along the way to the truth. ABOUT THE AUTHOR :: Melody Carlson has written more than 200 books for teens, women and children. Her novels range from serious issues like schizophrenia to lighter topics like house-flipping, but most of the inspiration behind her fiction comes right out of real life. She's won a number of awards (including Romantic Time's Career Achievement Award, the Rita and the Gold Medallion) and some of her books have been optioned for film/TV. Carlson has two grown sons and makes her home in the Pacific Northwest with her husband and yellow Lab dog. To find out more about Melody Carlson, visit her website. I received a free electronic copy of this book from Revell Books via Net Galley. This review is my own opinion. In honor of National Adoption Awareness Month, my ebook "Peace in the Process: How Adoption Built My Faith & My Family" is on sale for $2.99 at Amazon. Want more stories? Like me on Facebook, follow me on Twitter, peek into my life on Instagram, follow 152 Insights at Bloglovin', or subscribe to receive "Insights in Your Inbox."